Launching a new business can be an expensive endeavor, particularly if you get pulled into a bad credit card deal. Tempting rewards schemes can mask a high annual fee or exorbitant interest rate. The wrong business credit card affects not only your quality of life but also your business—and if you default, your personal assets may be at risk. You could find yourself taking another loan to pay off credit card debt. The average debt of small business owners is $195,000. Money is necessary to finance your company, but you don't need to bury yourself under a mountain of debt to find success. The right card can provide you with the funds you need while yielding lucrative rewards. Take a look at these eight business credit cards and decide which one best suits your needs. Business credit cards can be a bit misleading, especially those marketed at "new" businesses. The truth is the age of your business doesn't matter, but there are a lot of other factors that do. Keep these five things in mind before you begin your search for the right credit card for your business. Credit cards are generally the same across the board, whether you apply for a travel rewards card or a business cash back card. Your personal and business credit history will make or break your approval. Make sure the major credit bureaus (TransUnion, Equifax, and Experian) have your accurate credit history, as well as the major business bureaus like Dun & Bradstreet. Business owners might charge a lot of expenses to a card until the revenue begins coming in. Certain cash flow schedules can make it easier to charge everything to a card and pay it off when the money arrives. While this is beneficial, make sure all purchases you make are strictly necessary. Failing to do so can put your business and personal assets at risk. If a business card offers "commercial liability," it means the business is liable for all debt. If the card offers "joint and several" liability, it means both you personally and the business are liable. The former option is a great option for lowering your personal risk when setting out in a new business. Business credit cards have more flexible payment terms than consumer cards do. Many cards provide the ability to defer payments until the business is generating enough revenue to cover the costs. Businesses usually make larger and more frequent purchases than the average consumer. Taking advantage of favorable rewards terms means you can accumulate rewards quickly and offset the cost of starting a business. 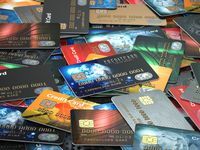 We researched the most popular and most valuable business credit cards on the market today and came up with our list of eight cards. Each of these cards excels with its rewards scheme, ease of approval, or in another area that makes it a valuable choice for business owners. We evaluated the key features, target demographic, fees and penalties, and best uses for each card. Though you may find a specialized, niche card that serves your specific business better, these eight are great starting points for any business line of credit. Ink gives the best signup bonus and has no annual fee. Chase Ink Business Cash comes with no annual fee, a lucrative signup bonus, and no APR for the first 12 months. That alone sets it apart from the competition. Chase is well known for its rewards cards, and this one is no exception. The downside is that customer service may be lacking, or so suggests customer complaints online. Earn $500 cash back if you spend $3000 within the first 3 months The signup bonus doesn't have any fine print. Just meet the spending threshold within the timespan and you'll receive it. Some credit cards require you to spend a certain amount each year just to break even, but there are no costs for card ownership with the Chase Ink Business card. Earn cash back on every purchase. You'll receive 2% cash back on the first $25000 for select purchases, and 1% on all other dollars spent, no matter how you shop for your business. The Chase Ink Business is great for new businesses.Those initial expenses can be offset with the 12 month 0% APR on purchases and balance transfers, and you can get extra employee cards at no cost. You're protected from fraud.Chase's Zero Liability Protection means cardholders are not responsible for any unauthorized charges made with their card or account. "Should I call and speak with a Chase representative for card verification?" Chase sometimes requires cardholders to speak with a representative for application verification. For new business owners, this can be a daunting prospect. The common experience is to simply wait it out if the application page requests you call in. In most instances, you will be automatically approved within a few days if you meet the requirements. The average approval score for a Chase Ink card is above 700, although some cardholders report approval with much lower scores. It's recommended applicants have a minimum score of 690 to apply. If you have a lower credit score than you'd like, make sure to provide as much information on your application as possible. Applying online is the easiest option.The online application takes only a few minutes to fill out and will require the usual information, as well as the legal name and type of your business. You may also be asked how the business is funded. If the company is backed by an Angel Investor, just enter "investor." Some customers were met with confusion when they spoke with representatives and verified an angel investor as their backer. You do not need established revenue.While proving successful revenue can be beneficial, you can qualify for a Chase Ink card even if your business is just starting out. For those with excellent credit that want no limits on their rewards, the Capital One Spark Cash Select is a solid option. The card provides unlimited cashback rewards on all purchases, has no annual fee, and provides a reasonable bonus. While not as exciting as the Chase Ink, spending enough in the first few months leaads to a nice little bonus in the form of account credit. Get unlimited cash back on all purchases.There are no rotating or activated categories to keep track of. You'll receive cashback rewards on all purchases regardless of whether you're wining and dining a client or buying printer paper. You are protected from fraud.In today's age of identity theft and cybersecurity worries, Capital One's fraud liability protection is a welcome benefit. You are not held responsible for any fraudulent purchases made with your card. You aren't limited to just receiving account credit with your rewards. You can redeem your cash for items like gift cards and other choices. These options change regularly, so log into your account to see what options are available when you're ready to redeem. There is no annual fee.Combine this absence with an intro 0% APR for nine months and you have a card that is immediately beneficial, with no need to spend a certain amount before you break even. The easiest way to apply for the Capital One Spark Select for Business is via Capital One's online form. You will sometimes be given the decision on eligibility in less than 60 seconds, but if not, you'll receive a letter within 7-10 business days. Your credit line will be determined within a few days.Even if you receive instant approval, you may not know what your credit line is for several business days. The card is for people with excellent credit.If you have subpar credit, do what you can to improve your score before applying. Repeated denials can lower your score even farther. Enjoy a delightful bonus of travel miles with this card. The Miles Select for Business is a strong travel rewards card for the business owner on the go. Capital One's customer service is also worth noting. Multiple customers have praised the company's prompt response times and friendly representatives. The Spark Miles Select for Business is the ideal card for the traveling business owner. The signup bonus is equal to a couple of hundred dollars to spend on travel. That may not seem like a lot, but combined with tax deductible business travel, it can go a long way toward your next ticket. $0 Fraud Liability protects you if the card is stolen.No matter how careful the traveler, a misplaced or stolen card is a likely occurrence. Capital One's Fraud Liability protects cardholders from the responsibility of unauthorized transactions. Capital One makes it easy to redeem your rewards. The Purchase Eraser allows you to be credited for travel purchases made within the last 90 days, but you can also use the Capital One Rewards Center to book a flight, car rental, or hotel with your miles. There is no annual fee.You benefit right away from purchases with this card since you don't have to spend a set amount to break even. The easiest way to apply for this card is via Capital One's online portal. The form will request information about how much revenue your business earns, the type of industry, and how old the business is. While all of these questions are not mandatory, answering them with as much detail as possible will improve your approval chances. The Spark Miles Select requires applicants to have excellent credit. Spend beyond your credit limit. Some expenses require you to go above and beyond what is allotted to you, and the Blue Business Plus lets you do exactly that. The amount you can spend outside your credit limit isn't unlimited but is based on payment and credit history, financial resources, and other factors. One thing to keep in mind is the deficient customer service. The main complaint we found was customers claiming American Express didn't honor their signup bonus. While intro APR offers aren't as desirable to most as signup bonuses, the low transfer fee can be useful for taking control of high interest on previous business debts. Perhaps you've been waiting to make a large purchase, this card offers as good an opportunity to pull the trigger on big purchases as any. Get premium points on your purchases.All business expenses like office supplies or client dinners yield premium points, and every purchase after yields standard points. Points can be redeemed for travel, entertainment, merchandise, and gift cards. The Blue Business Plus has one of the most flexible redemption plans, allowing you to redeem points for travel through AMEX's transfer partners. You can also use points for entertainment, merchandise, and gift cards. The card pays off right away.The Blue Business Plus has no annual fee, so you can enjoy profiting from your business purchases immediately. The points add up quickly, especially because you still receive points even when spending beyond your credit limit. You can apply for the American Express Blue Business Plus card either online or by calling 1-800-519-6736. Make sure to have your business name, address, and annual revenue on hand when you apply. People report approval even with mid-range credit scores.Unlike the Capital One cards higher on this list, the American Express Blue Business Plus doesn't require an excellent credit score. Big credit line, no annual fee, and an enticing rewards. Like the Blue Business Plus, the SimplyCash Plus lets you spend beyond your credit limit but still graces cardholders with lucrative rewards and no annual fee. The SimplyCash has great customer service reviews, despite being an American Express issued card. Although the SimplyCash no longer offers the original signup bonus, you can spend more than your credit limit as long as you pay back the amount over your limit each month. Paying the overdue amount on time increases the amount you can spend.While you should strive to never carry a balance, paying the amount over your credit limit on top of the minimum payment each month increases how far over your limit you can go. The SimplyCash name is appropriate as it simplifies the process by giving your statement credit on the second billing statement after the eligible purchases. You can make the most of this by spending in the right categories. Earn high premium cashback rewards at office supply stores.You'll receive the same high premium amount for wireless telephone services, premium rewards on a cashback category of your choice, and a standard 1% on all other purchases. There is no annual fee and a short intro APR period.Major business purchases made during this period can be paid off quickly without the added cost of interest, if business budgets are followed precisely. Unlike a large number of business rewards cards, you do not need excellent credit to qualify. Apply online or via phone.Entering your information on the secure web portal is easier than navigating audio menus, but if you want to call rather than apply online, the number is 1-800-519-6736. The decision is not instant.You will need to wait to find out whether you have been approved or denied for the card. A charge card that comes with helpful flexibility. While most charge cards must be paid in full each month, the Business Green Reward Card allows certain purchases to be paid overtime with interest. This feature, stacked with the membership rewards points earned on eligible purchases, makes the Business Green Reward Card a solid choice for any business. The Business Green Reward flies in the face of the normal (read: negative) AMEX customer service reviews. The majority of cardholders love the card and praise its flexibility and reward system. This is a signup bonus in the truest sense of the word. After you make your first purchase with the card, you automatically receive a boon of Membership Rewards points. Then you continue to earn the most points for eligible purchases in select categories. When you purchase directly from amextravel.com, you'll earn more points per dollar spent on other purchases. All standard purchases yield a point to point ratio. American Express Membership Rewards points don't carry much value outside of the company, but you can redeem directly through the website for travel and gift cards. You can also use your points to pay for Uber. Be wary of the annual fee.The first year of card ownership is free, after which the cost rises to $95 per year. "How does the spending limit work?" Although there is no preset spending limit, the purchasing power of the card adjusts based on your payment and credit history, the financial resources you revealed to American Express, and how you use the card. If you fail to pay the card back in full each month, your spending power will decrease. While you may not always get immediate approval (or denial), applying online is the fastest option. The phone number for application is 1-800-519-6736. You will personally need good or excellent credit to qualify.Although many business cards only take business credit into account, the Business Green Reward Card requires the applicant to have, at a minimum, good credit. Everything that the Ink card does plus an upgraded rewards program. What the Ink Business Cash Back card does well, the Chase Ink Business Preferred card does even better. This is one of the best business travel rewards cards available. The Chase Ink Business Preferred receives rave reviews for how well customer service handles problems that arise. The signup bonus is very generous no matter how you define it. For a business that requires frequent travel, it would be easy to hit the minimum spending limit on hotel stays, airfare, and other expenses in the allotted time. You'll earn points per dollar spent.Like other cards on this list, Chase Ink offers points for every dollar spent, at various premium rates. That means if you spend in certain categories like travel, shipping, internet, advertising, and cable or phone each year you could rack up rewards quickly! The easiest way to make the most of your points is through Chase Ultimate Rewards. This program increases the value of your points by 25%, which is nothing to scoff at. You need to earn 9,500 points each year to cover the annual fee.At the current rate of point conversion that could be doable for some spenders, which would make this card worth the cost. "Are Chase Ink credit cards issued on Visa or Mastercard?" Chase Ink credit cards are Visa cards. Travel rewards cards are notorious for requiring high credit scores for approval. You can improve your odds of approval by lowering your credit utilization. Apply online and save time.The online application requests the legal name of your business, its annual revenue, length of time in operation, and other pertinent information. Limit the number of Chase cards you have open.Credit card companies are often hesitant to approve applicants that already have multiple cards from a single company. If you are approved for multiple Chase cards, your credit limit may be lower than normal. A low risk option for those with less than stellar credit. Subpar credit scores can hurt your chances of approval, but the Spark Classic is aimed at those with fair credit or better. The tradeoff is that the rewards aren't as impressive as the rest of the options on this list. You won't receive a huge amount of cashback rewards for spending a certain amount with this card, but you also don't need to worry about paying an annual fee each year. Capital One gives the option for automatic redemptions at a set time of year or when a certain number has been reached, but you can also redeem your cash back for account credit for previous purchases or gift cards for future purchases. You'll receive standard cash back on all purchases.There's no limit to what you can earn and no categories to keep track of. "Is the Spark Classic for business worth it?" The Spark Classic isn't a high yield rewards card, but it can be a strong starting point for business credit. Newer businesses often lack the necessary credit to apply for better cards, but the low credit score requirement for the Spark Classic isn't an impediment. The card can be worthwhile for building credit but is not the most powerful cash back rewards card by a long shot. Save the hassle of navigating audio menus by applying online through Capital One's web portal. This form requests a lot of information, but the more you fill out the better chance you have of approval. You will be denied if you already have two Capital One cards.Capital One imposes a strict two-card limit on cardholders. Cash back rewards can offset the cost of everyday purchases. Travel rewards make jetsetting all over the world easier. Built in expense tracking can lighten the load during tax season. The right credit card can help build your business' credit history and give you the option for better lines of credit in the future. The eight options on this list have favorable rewards, fees, and are targeted at small business owners. Pick one that works for your business needs knowing that you made a smart call.